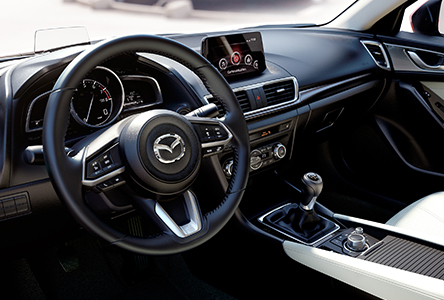 A refined, elegant interior with premium features make the MAZDA3 a unique proposition. G-Vectoring Control is the latest in our SKYACTIV series of technologies. Winner of the AJAC 2017 Best New Innovation Technology Award, it provides integrated control of the engine, transmission, chassis and body to enhance the feeling of connection between car and driver. With the SYKACTIV-Body, safety means a strong structural design that uses ultra-high-tensile steel in critical areas. 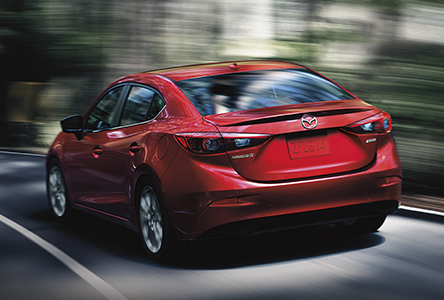 The MAZDA3 has been an IIHS Top Safety Pick for over 6 years (2012–2017). Easily control and view the functions on your MAZDA CONNECT††† infotainment system using the HMI Commander and full-colour 7” touchscreen display. A KODO designed sleek front grille, piercing headlights and available fog lights‡‡‡ make a formidable first impression. Enjoy flexible passenger and cargo options with a 60/40-split fold-down seatback‡. The new LED headlights♦ are not only striking, they also offer high-quality clarity and illumination on the road at night. †Estimated fuel economy on the Mazda3 GX and GS with manual transmission and the GT with automatic transmission and i-Eloop. Estimated fuel economy based on Government of Canada’s approved, revised 5-cycle testing method. Your actual fuel consumption may vary depending on how, where and when you drive. For comparison purposes only. For more information on revised 5-cycle testing, visit mazda.ca/5cycle. ‡Standard on the SE, GS, 50th and GT models. ‡‡Available on the GS model with i-Activsense Package and the GT model with Premium Package. †††Available on the GX model with Convenience Package and standard on the SE, GS and GT models. ♦ Available on the GS model with i-Activsense Package and standard on the GT model. **Offered pricing for the 2018 Mazda3 GX (D4XK68AA00)/Mazda3 GS (D4SK68AA00)/Mazda3 50th (D4EK88CA50)/Mazda3 GT (D4TL68AA00) is $16,000/$20,400/$23,000/$24,100. Pricing based on Manufacturer's Suggested Retail Price (MSRP). Pricing subject to change without notice. See dealer for details. Offer excludes freight, P.D.E. and fees. Offer excludes PST/GST/HST.